D’eagraigh Misneach Átha Cliath caint phoiblí rathúil in Ionad an Phiarsaigh i lár na cathrach aréir chun dearcadh radacach s’againn ar chás na teanga agus an claochlú sóisialta atá ag teastáil sa tír seo a phléigh le Gaeil na hardchathrach. 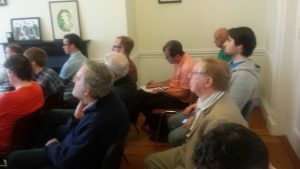 Labhair Seanán Mac Aoidh ar stair an ghrúpa agus ar na spriocanna agus cineál gníomhaíochta a dhéanann Misneach sa lá atá inniu ann, chomh maith leis an dearcadh sóisialach atá againn ar shlánú na teanga agus tábhacht na Gaeltachta. 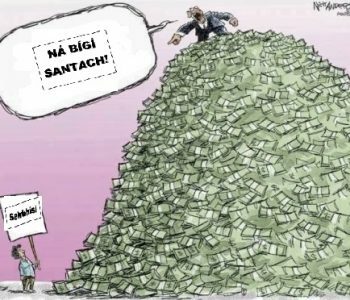 Labhair Ben Ó Ceallaigh ansin faoi cuid de na héigeandálaí éagsúla atá ag bagairt ar an gcine daonna uilig, ó thaobh na timpeallachta, na polaitíochta, agus na socheolaíochta de. Mhínigh sé go gcreideann Misneach gur gá do na Gaeil bheith ag tacú le hiarrachtaí éagsúla chun saol níos fearr a bhaint amach agus chun dúshlán a thabhairt don chóras eacnamaíochta atá ar nós cuma liom faoi riachtanais na cosmhuintire. Thug Katie Mhic Gréill, eagarthóir Mhionlach, óráid phaiseanta uaithi faoin nasc idir an feimineachas agus gluaiseacht na Gaeilge, agus an chaoi ar chóir do Ghaeil tacú le feachtasaíocht ar son chearta na mban. Phléigh sí an géarghá atá le tuilleadh ban a bheith páirteach i saol na Gaeilge, agus i Misneach, chun dul i ngleic leis an seandearcadh nár chóir do mhná a bheith gníomhach sa bpolaitíocht. 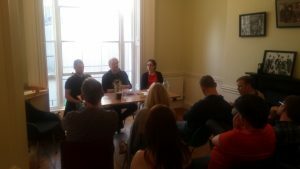 Misneach Dublin organised a very successful public talk in Ionad an Phiarsaigh in the city centre last night to discuss our radical analysis of language revitalisation and the need for social transformation in Ireland. 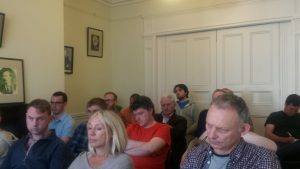 Seanán Mac Aoidh spoke about the history of the organisation and our goals and activism at the moment, as well as our socialist analysis of the language question and the importance of maintaining the Gaeltacht. Ben Ó Ceallaigh then talked about the various environmental, political and social crises facing humanity. He explained that Misneach believes that Irish speakers should be involved in campaigns to create a better future for the great mass of the population whose needs are ignored by an economic system which cares only for the enrichment of the few. Katie Mhic Gréill, editor of Mionlach, gave an impassioned speech about the link between feminism and the language movement, and how important it is that Gaels support women’s liberation. 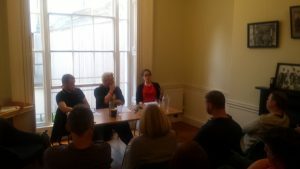 She also discussed the need for more women to be active in Irish-language activism, and in Misneach, to challenge traditional narratives of politics being the preserve of men. Misneach will hold a similar public talk in Cork during July. A video and podcast of the talk is available above.